You are here: Home / Blog / Inspire / Books on the Bus is a Hit! Everyone loves Books on the Bus! 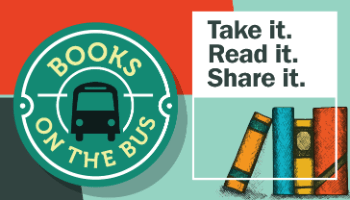 This unique program, a collaboration of CAPRA, Red Deer Transit, Red Deer and District Family and Community Support Services (FCSS), Red Deer Public Library, and Cosmos, connects Red Deer Transit riders with free reading material to enjoy during their commute, on their lunch break or anytime. Books for all ages and reading abilities are available including children’s books, graphic novels and fiction and non-fiction for adults. We’re getting noticed. See this blog post from The Militant Writer. Donate books at the GH Dawe Centre, The Recreation Centre or The Collicutt Centre.